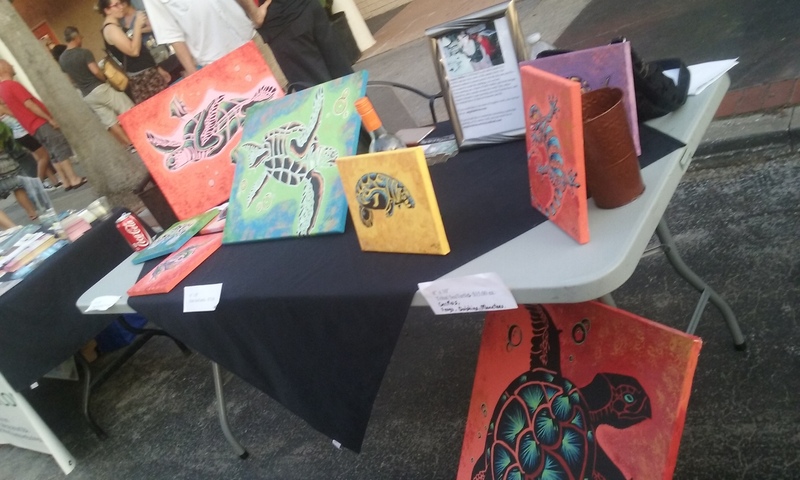 Last month, I attended the 3rd Friday event after a friend hooked me into it. 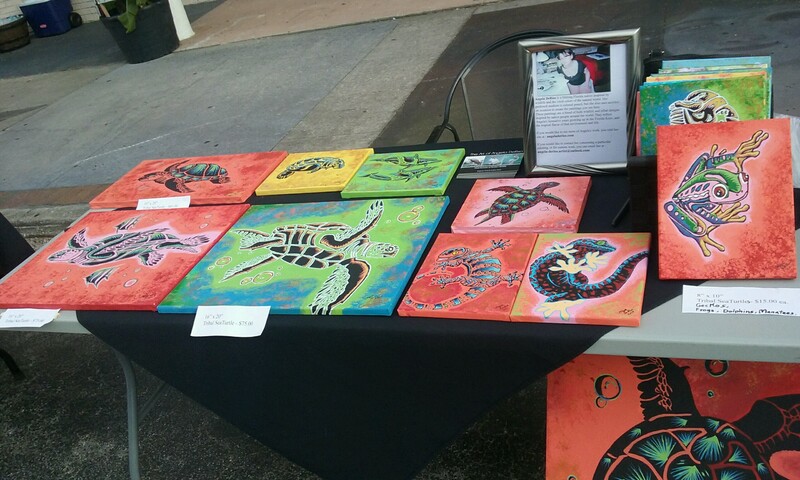 I took my canvas acrylic paintings that I’d done some time back last year, and set up a single table, no tent or anything fancy. I went into it expecting the same outcome of my past experiences of nothing selling. The evening turned out to be more positive than I thought. My table at the start of the event. Showing the largest piece I had for sale. The table after several sales. I was completely unprepared to display my stuff, but somehow managed anyway. 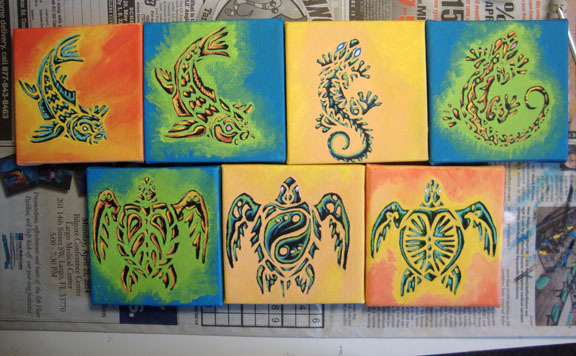 Most of my 8″ x 10″ canvases started to sell about an hour or two into the night. I only have 2-3 left from that night. My larger canvases were a 10″ x 20″, a 22″ x 28″, and two 16″ x 20″s. The 10″ x 20″ sold that night, and one of the 16″ x 20″s sold a few days later through a person I met during the event. After the event, I started thinking more about how this type of artwork sold so easily, and that I should do more of it for the next event. I am still conflicted as to having two different mediums and styles of art, and how to make that work. I don’t plan on stopping the color pencil work that I do, but rather focusing on where it would sell and what kinds of products (such as prints, bookmarks, coasters, etc.) would help facilitate sales. I do plan to have card sets made of several of my pieces, as both useful and collectible items. I am currently at work painting more canvases, this time smaller sizes. I’m making not just turtles, but other sea life and tropical based designs. Here are just a few that I’ve completed. 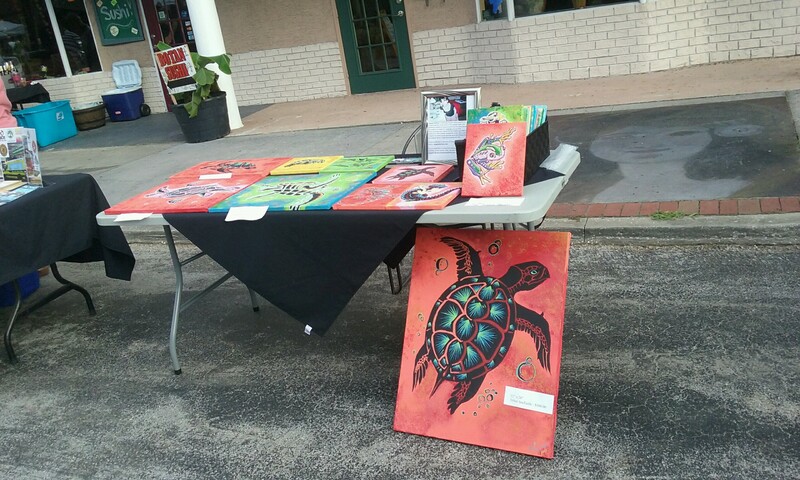 The large 22″ x 28″ seaturtle canvas I had for sale was donated to a good cause with the great people over at Dobermann Rescue of Lake Placid. It will be raffled off to support the rescue of many great Dobies. Other than painting like crazy, getting new cards made, and writing down ideas, I’m looking forward to next 3rd Friday here in Safety Harbor! This website is also due for an update as well, so look out for that!